We can say that CNBLUE is not missing activities these days. Just three months after the release of the previous single, the band, who was holding his first world tour and the Zepp Tour in Japan, was coming back on July 31 with his 6th japan major single, Lady. 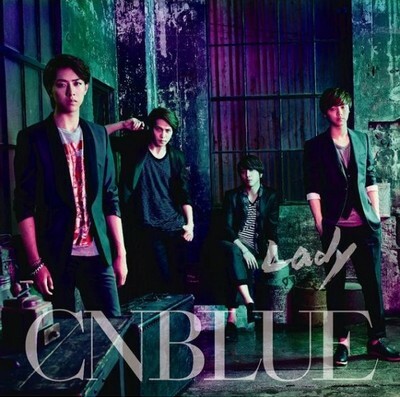 When we learned then that a new album is scheduled for the end of August (same way that the single Come on which was followed by the album CODE NAME BLUE, one year ago exactly), we may think that CNBLUE produces too quickly new releases one after the other in Japan. Moreover, since the two last singles now, FNC Entertainment decides to release not two but three different versions, including two limited editions with a DVD giving exclusives bonus. Judicious process? I don’t think so. After Blind Love, which was a sweet ballad, we could expect the reverse of CNBLUE's color with a title track purely rock and energic like the ones we could often listen to among the japanese songs. Fail for this time. Despite his refreshing disco sound made for the summer time and which make you dance, Lady is a song too pop and dance and too simple. It’s dull and without any emotion even if Yonghwa sings perfectly, especially during the chorus. Guitar riffs are limp, have no strength and are hidden by the disco rythm and pop elements dominating. However, the melody is a bit catching, but after so many times played, it’s not possible to listen to it for a moment. So, to give a positive point, Lady is able to show that musical influences of CNBLUE are increasing non stop and very various. The band’s style has no limit. The negative point is that this test of a new sound wasn’t enough operated. 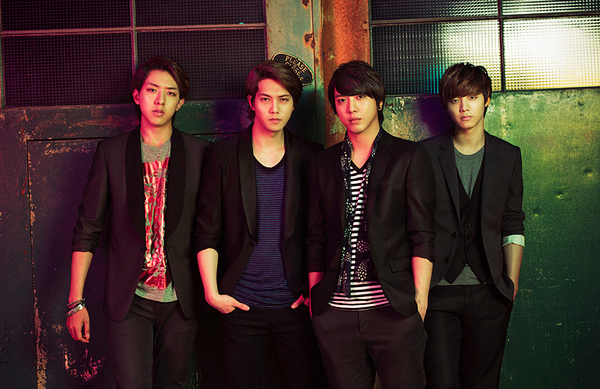 The fans addicted to the rock sound of CNBLUE will be difficult to convaince. With this title track, a PV was released. It is included on the limited edition A of the single. And unfortunately, after seeing the teaser which announced the color, it’s not really better than the song. It’s time for the Japanese to take part to their imagination. On the other hand, Blind Love's PV and even Robot's PV were more innovated. Apart the bright colors, the atmosphere is morose and sullen, the views and framing are without success, it's similar to the ones in the PV of many boysbands, where the beauty of the members is important in order to catch the attention of the viewers. Finally, an important thing that we miss in this PV is this “Lady” of course! The song is named Lady, the lyrics are sung for a “Lady”, we are expecting to see her. But she’s not here, there is no story behind the video. After listened to the first track, we can feel better when we hear Don’t care. No doubt, we are able to know that this song is one of Yonghwa's compositions himself, unlike the title track which is co-written. Don’t care is an acoustic song which spread a sweet and warm wave with honest, comforting and thankful words. Yonghwa sings the song with tenderness and raises his voice during the chorus. By listening to this melody, the fans, and not only Japanese fans because the lyrics are written in English, can just be touched, just because the lyrics are written for them. Don’t care is a relaxing and comfortable song and I can only play it again and again. It’s indeed the uncommon pearl of this single. The last song Monday, is played with almost the same tempo, with an acoustic guitar. Also a pleasant song to listen to, but not very catching for all that. I think I could say that this song is a bit insipid. The lyrics are simple, very simple, with a thought to the people who have to wake up early Monday morning to go to work. Ah... But don’t forget that the future is for the people who get up early morning, right? A them song which remind us the one of Robot, from the 4th japan major single. Like the musical influences, we realize with this song that CNBLUE doesn’t focus on the theme of love only, which is often the main subject of K-pop bands’ songs. CNBLUE can speak about various things and thoughts, interesting or banal, and their current feeling. The argument that will encourage the disappointed fans to buy the single would certainly be the exclusives bonus included in the two limited editions. We can find live performances carefully selected. There are Blind Love release event live for the first and the Mezamashi Live 2012 for the other. Two performances of a band that reveals all its skills and rock side in front of a crazy audience. I think I took more pleasure watching these DVDs non stop instead listening to the songs of the single. So, Lady, this single released too quickly, is not really bad, but not better than the previous singles. Be careful to not focus on quantity instead quality. Even if Lady got good responses with good selling, it is unfinished, not enough innovated and not surprising. Often, we can’t do things well if we do it quickly. Will the second japan major album What turns you on?, scheduled to be released on August 28th, be able to beat Lady? The answer will be in the next review! Please find the French version of this review by clicking on the image above!